RB Grant install solar pv panels all over Scotland from our Fife base. With over 17 years experience installing Solar PV power systems in Scotland we are the number one choice. We design and supply solar energy systems to meet our customers energy needs. We install domestic, commercial and industrial solar from 1kw to 50MW and are fully MCS approved. RB Grant are the solar power installers you can trust. We offer a budget system for the home from as little as £600 and a 4kw system from £3900 fully installed and certificated. We install battery storage devices from 2kw and above. We do not require a deposit for our installations giving our customers piece of mind. RB Grant are expert in solar energy systems for the home, reducing energy costs with systems tailored to your needs. We provide a range of solar panels from Poly, Mono and Hybrid. We are also approved Sunpower solar panel installers, the worlds best solar panels. Our commercial standard solar pv systems start at around £10,000 for a 10KW solar pv system fully installed. We have hundreds of happy solar power clients and provide a quality installation at a competitive quote. We pride our self in being one of Scotland top solar panel installers. We are approved by the Energy Saving Trust, MCS and RECC. We are a family run business established in 1974 who are trusted installers of photovoltaic (PV) solar panel systems and the number one choice for solar PV installations in the Fife area and all over Scotland. We actively promote the use of renewable energy sources. Our design service takes into account the SAP calculation but we also use the leading solar pv software PV SOL to design the most efficient system at a competitive cost. We can supply a variety of solar panels , inverters and mounting systems to give our customers a system that suits their budget and energy use. We provide a range of additional products to enhance you PV system including micro inverters, monitoring systems, water heater boost diverters and solar battery storage. We are MCS accredited solar PV installers in Scotland, certifiers of construction and members of REAL assurance. With the end of the FITS we await the government implementation of the new SEG or Smart Export Guarantee. The SEG will allow owners of generators to charge for exported energy. This helps to reduce the pay back time to around 8 to 10 years and then the solar panels will make you money for the remaining period. With the rising energy costs and the peak value for the feed-in tariff, there is never a better time to consider a photovoltaic solar panel system. We provide a quality service from the initial design right through to the feed-in tariff registration. All our staff are fully qualified solar PV engineers and can provide a quality installation in the home and in commercial premises. All our design services are free for solar PV. We also supply a full design and installation service for Off Grid Solar PV system. From solar pv for the home, commercial and farm buildings to provide electricity to buildings which may suffer from lack of grid supply. We also offer a bespoke service for Caravan and motor home solar panel systems fully designed and installed. Solar Photovoltaic systems (solar panels) use energy from the sun to create electricity used to run household appliances and lighting. When sun light shines on a Photovoltaic (PV) panel, an electric field is created across the cell resulting in the flow of electricity. Using a renewable energy can save you money and help reduce climate change. At R.B. Grant we can find which solar panels are the best for you. We choose from a range of solar power products to provide the most effective and efficient solar PV panel system for all our customers. 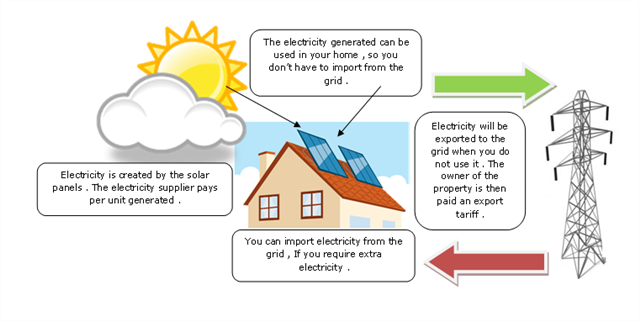 Is my home right for Solar PV Panels? Is your home in a suitable location for solar panels? Ensure your home is not over-shadowed by trees or buildings. This can reduce the output of the system. Do you need a building warrant for solar panels? You may require a building warrant from Edinburgh Council but as certifiers of construction we can apply for the warrant and approve the installation. Always obtain planning permission from your local government authority in case the property is a listed building or in a conservation area in Edinburgh. We can help with this. Solar panels and the mounting can be heavy. The roof must be strong enough to take their weight. We can arrange a structural engineer report where required. Our fully qualified team of designers, installers and certifiers deliver a quality solar panel installation at a competitive cost. All our installations are covered by a 5 / 10 year product, 10-year workmanship and 25-year output warranty. For example, a 3kw electric photovoltaic solar panel with generate £1,000 per year and £25,000 for the standard lifetime of the units. To see more examples have a look at our Photovoltaic Panels (PV Panels) Feed in Tariff / Payback page. For a free quote, contact us today. You can trust R.B. Grant to provide a quality service at a competitive price for solar PV installations. Zero-interest loans of up to £2,000 are available for Scottish householders to help them install heat and electricity generating renewable systems – Energy Savings Trust, Home Renewables Loan Scheme. Renewable Energies – we also supply a full design and installation service for solar hot water heating systems and wind turbines.